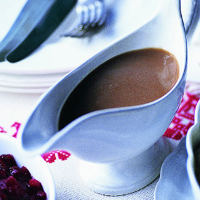 There’s nothing quite like gravy to complete a roast meal. Make the stock using the giblets 1-2 days before, then finish the gravy on Christmas Day. Wash the giblets with cold water, then place in a large pan with 1.5 litres cold water. Slowly bring to the boil. As the water begins to bubble, skim off any scum with a slotted spoon. Add the remaining stock ingredients, then cover and simmer for 30 minutes. Remove the lid and simmer for a further 30 minutes, or until reduced by half. Remove the stock from the heat and strain through a sieve. Leave to cool, then cover and chill in the fridge overnight. Before making the gravy, reheat the stock until just boiling then remove from the heat. When the turkey is cooked and resting, spoon off the fat from the roasting tin, leaving the dark juices behind. Place the roasting tin on the hob and bring to a simmer. With a wooden spoon, stir in the flour and incorporate all those tasty sticky bits on the bottom of the tin. Cook for 2-3 minutes, stirring continuously to avoid lumps. Remove from the heat. Stir in two ladlefuls of the stock. Return the tin to the hob and cook on a low heat for 2 minutes, then gradually add the remaining stock and wine. Bring slowly to the boil, stirring constantly, until thickened. Simmer gently for 5 minutes. Season to taste, then strain into a warm jug and serve.